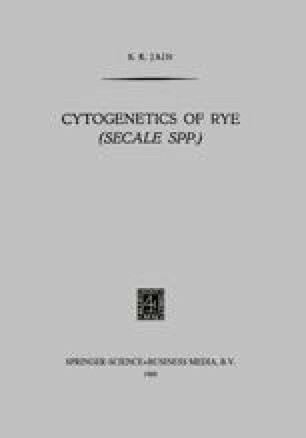 Nemec (1910) was probably the first to record the chromosome counts in Secale cereale. He observed 18 chromosomes in endosperm cells. Two other reports, those of Westigate (cited after Stolze, 1925) and of Spillman (cited after Hector, 1934), gave 12 as the somatic number. Nakao (1911) on the other hand found n = 8 in the first metaphase plates of microsporogenesis. Following this appeared Sakamura’s (1918) count of 2n = 14 and later Kihara (1924) who found some cells with n = 8 in plants having 2n = 14, tried to explain these discrepant counts on the basis of extra chromosomes. According to Ferrand (1923), ocasional nondisjunction of one the seven bivalents gave rise to plants with an extra pair whereas cells with even higher numbers could arise by fragmentation at some stage. Still the haploid number remained uncertain until a number of careful mitotic and meiotic counts along with the analyses of extra chromosomes, established 7 as the correct one (Stolze, 1925; Aase and Powers, 1926; Thompson, 1926; Emme, 1927; Lewitsky, 1929, 1931; and others) and higher numbers of 8, 9, or 10 being for the strains carrying B-chomosomes (Emme, 1928; Darlington, 1933; Hasegawa, 1934; Popoff, 1939; Müntzing, 1944, et seq. ).